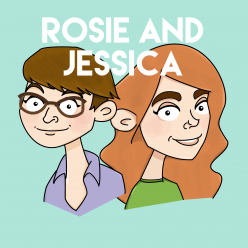 In episode 88, Rosie and Jessica report back from their outing to the MCM Expo, where Jessica had that most Basic Zombie of experiences with her first Pumpkin Spice Latte. They not only met Holtzmann and the Schuyler sisters, but had tea with a beloved listener! Also Jessica got a pet, who Rosie is keen to rope into the Day of Fun internship programme. The final Bake Off chat leads nicely into a Top 5 cookbooks. Take care of yourselves. Jessica picked What About Me? by Moving Pictures, while Rosie went for Houdini Crush by Buke & Gase. David S. Pumpkins is his own thing. Making jokes about Trick or Treating at the White House now seems too on the nose, but here you go anyway. Rosie was on Friend of the Show Lucas’ podcast The Math of You talking about how the internet ruined everything and, unrelatedly, badgers.